According to analytics firm Mixpanel, iOS 9 is making its way into the mainstream with the quickness, even though there were some early download troubles for some. The company tells us that iOS 9 is nearing 12 percent adoption less than 24 hours after it was released into the wild, which is faster growth than iOS 8, says Mixpanel’s CEO Suhail Doshi. I suspect that some of this had to do with the first-time consumer beta getting people familiar with the new features and in tune to the release schedule. 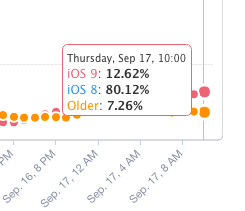 iOS 9 has received 12% adoption in the last 24 hours and is being adopted similar to iOS 8 last year. This kind of adoption took Android’s latest operating system, Lollipop, in comparison 5 months to achieve. One huge advantage Apple got right this year over last year was that the update is much smaller than last year (3.5x smaller) — Apple has empathy for its users who have nearly maxed out the space on their phones. However, one issue for it being substantially slow compared to iOS 7 is that servers are having trouble keeping up right now as people update. You’ll notice that iOS 9 has already passed the “older than iOS 8” crowd in installation numbers, with that crossover happening earlier this morning. One thing that might help out with iOS 9’s adoption is its download size – a full 3.5 times smaller than that of iOS 8. Grab all of your iPads and iPhones and get to downloading. Companies are pushing iOS 9 updates for their apps at breakneck speed.